Our wide range of dining tables and chairs in solid hardwood make it simpler and more affordable to create your perfect dining room. Quality comes first at Oak Furnitureland, and this is reflected in our luxurious and long-lasting dining table and chairs. Available in a range of stylish colours, finishes, and sizes, your perfect dining table set is right here. Choose from rustic solid oak, natural solid mango, painted brushed oak and more; our beautiful collections span a diverse range of contemporary and traditional styles and finishes. We have everything from traditional dining table and chairs sets to those featuring stunning round tables, perfect for making the most of small or oddly shaped dining rooms. If you love to entertain and need room for extra guests at your table, why not try an extendable dining table and chairs set? Our dining table sets are made with the highest quality hardwood oak, mango and painted hardwood timbers, meaning that your dining table and chairs will look great for years to come. Don’t forget to complete your new dining set with one of our fantastic sideboards, display cabinets and dressers to store your tableware. Our fine selection of dining chairs come in pure hardwood, genuine leather, and soft fabric, and can be matched with any table or desk with the same wood finish, regardless of range name. A great dining room should be warm, comfy, inviting, and the perfect place to host memorable meals and occasions. But, the first thing you should consider is the size; do you have a large dining room able to cater to larger parties and a dining table and 8 chairs, or have you got space for a smaller dining table and 4 chairs in your kitchen? 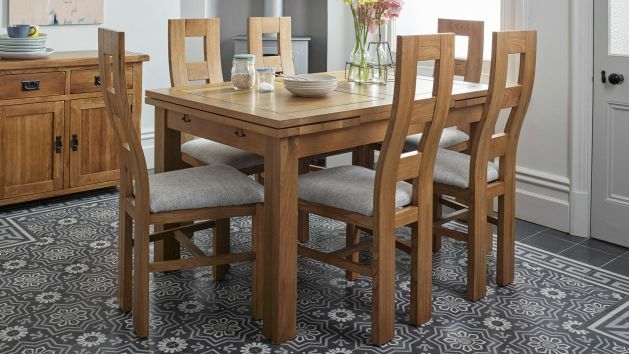 Oak Furnitureland has a wide range of small, medium, and large dining table and chairs, including extending tables that allow you to make the most of the space you have. Next, select a wood finish that suits your dining area and personal taste; our tables come in a variety of striking colours, from dark oak to lighter solid mango, and wood painted in colours ranging from off-white to grey. And, because nobody likes to feel like they’re under the spotlight whilst eating, set the mood by integrating dimmable lights into your dining area, instantly creating a more relaxed and intimate atmosphere. Think about your favourite restaurant and how they use lighting to create ambience; can you recreate this in your own home? Each one of our dining sets is built from durable, long-lasting solid wood, that can last a lifetime when well looked after. For that reason, we recommend using clear wax polish to maintain and enhance the wood’s natural beauty. Take a look at our dining room furniture guide for more handy hints, tips, and tricks for getting the best out of your dining room and furniture. Our flexible furniture financing is designed to make buying your beautiful new dining table set more affordable, giving you the chance to spread the cost across monthly payments. For purchases over £500, you can split the cost up over four years, and for orders over £3,500, benefit from interest-free credit for up to three years. Our fast, seven-day delivery service reduces waiting time, allowing you to complete your perfect dining room in no time.